The Themza Team is glad to announce the release of the brand new free Moodle Theme – Knowledge Library. Starting from today, the Knowledge Library 4images theme can be downloaded for free from the Themza website by all educators who manage e-course projects in Law, Literature, History, Linguistics, Computer Linguistics, etc. related studies. What makes the Knowledge Library Moodle theme special is that it accents the necessity for preserving the traditional book-reading habits during the e-learning process. 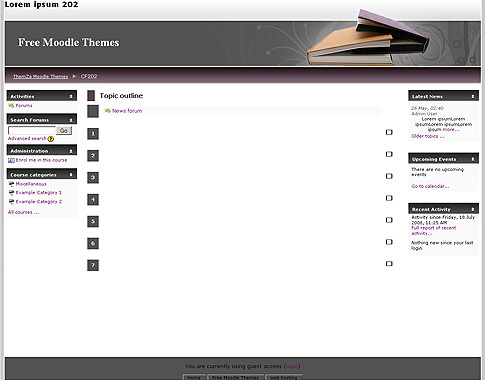 The theme brings an academic feel to your Moodle website, making it look like a knowledge library to your students. The Knowledge Library Moodle Theme is now freely available for download from our website. You can first review the theme’s demo version to get acquainted with its overall look and feel. This entry was posted on Sunday, July 20th, 2008 at 11:50 am	and is filed under Moodle. You can follow any responses to this entry through the RSS 2.0 feed. You can leave a response, or trackback from your own site.